Effectively penetrate deep pores and thoroughly clean the skin. The scraper probe will go deep into the skin, remove dirt and aging skin. Sonic vibration makes special beauty liquid thin and atomization. The clogging cosmetics residue and pore sweat emulsion can be remove with the splashing elimination. Eliminate wrinkles and skin relaxation phenomena. 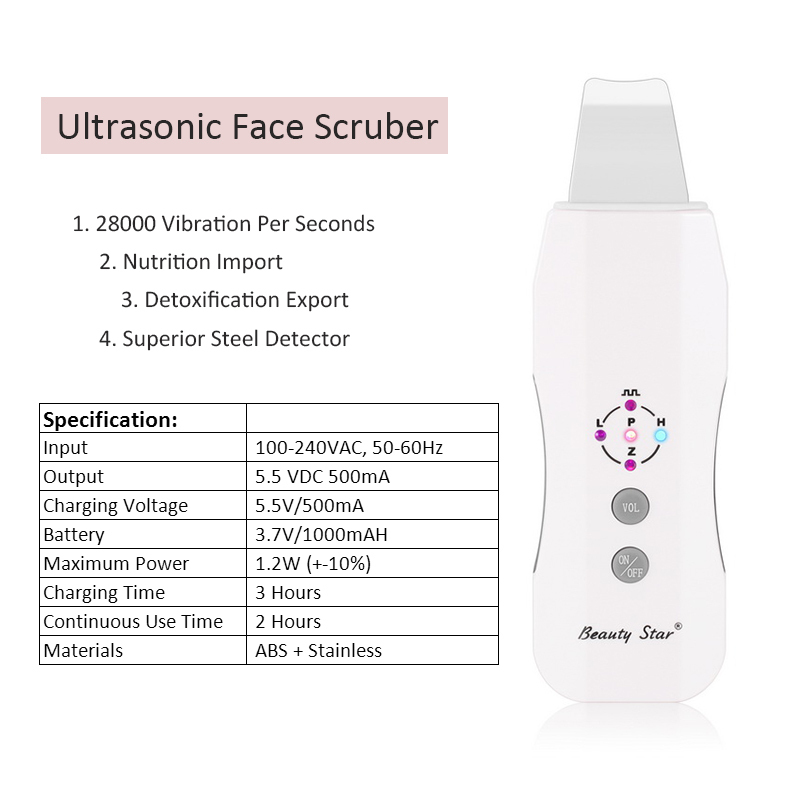 As it is a kind of Rechargable Skin Scrubber with lithium battery, you can use it after charging, without connect to the power all the time. Packed by retail boxes, suitable for gifts and home use. Composed of two power-change slices piece, it can produce up to 28000 times of beauty import & export, effectively help to solve the skin problems and beauty up. By 28000 times per second microseism, it makes VC, collagen and other large molecular decompose and refine, easy to absorb, improve the natural permeability of cosmetic ingredients, so that to import the nutrition much better. By 28000 times per second microseism, it makes skin, pores in the black dirt easily decompose, refine and export. It makes a warm feeking of massage, and accelerates blood circulation and detoxification. The spade shape detector is made of corrosion resistance, high temperature resistance of the top 304 stainless steel. It has a higher stability, durability than a plating one for human health and enjoy much stable output, which ensure more secure use. 1. Clean face with face cleanser and use warm water dipped towel or facial steamer to open pores. 4. Adjust to “Â?img alt="QQ20171010173732" height="17" src="https://ae01.alicdn.com/kf/HTB1wBlTk3oQMeJjy0Fpq6ATxpXaj.jpg?size=1183&height=58&width=76&hash=419936e55f41e0f78afc90d66f6cc451" width="24"> â€?mode to tighten and lift skin. This machine have: US Plug, Europen Plug. If you need British (UK) Plug or Australia Plug, we will send you an extra adapter.